Mechanisms of skin break down in the development of human pressure sores are still unclear. This study was undertaken to clarify the morphological characteristics of the dermal papillae in the skin associated with pressure sores. Skin tissues were excised from the sacrum of a Japanese subject post mortem, where a superficial pressure sore had developed. Light microscopic and transmission and scanning electron microscopic examinations were performed. It was found that the atrophic, irregular contour and alignment of the dermal papillae were characteristic of the boundary area between healthy and damaged areas. In addition, a relatively dense network of collagen fibres in the papillary layer of the boundary area was observed when compared with the healthy area. These findings suggest that the morphological changes of the papillae observed in the boundary area affect micro-circulation, impairing tissue viability by inhibiting nutritive blood supply and by accumulating metabolic by-products which predispose to tissue damage. Pressure sores are still a major problem affecting elderly and bed-bound patients. Mechanisms of skin breakdown in the development of human pressure sores are not fully understood. Most histological studies on pressure sore development have been undertaken using animal models	, , . However, there is a limitation to the interpretation of results obtained from animal experiments in terms of human pressure sore development, since the structure of animal skin is not the same as human's and animal models of pressure sores have been produced by a single ischemic event using a mechanical indentor. We believe that human pressure sores observed in the clinical area are a consequence of multiple ischemic events produced by a combination of axial and shear stresses. On the other hand, most human studies on pressure sore development have been carried out by measuring physiological changes occurring in the skin associated with pressure application, for example, skin blood flow measurement , . However, it is not sufficient to assume underlying mechanisms of tissue break down in human pressure sores from results of physiological data. Only a few studies are available for the understanding of human pressure sores which use histological methods , . Witkowski and Parish , who attempted to investigate human pressure sore development extensively, reported that the initial changes were found in the papillary dermis where the capillaries and venules were greatly dilated showing blanchable erythema. Barnett , developed a diagrammatic representation of how a pressure sore develops in which the changes in collagen characteristics in the papillary layer of the dermis were described. The dermal papillae, which are the site providing oxygen and nutrition to the epidermis, are of great importance in maintaining the integrity of the skin and protecting the body from external forces. However, there is little information available about morphological changes in the papillae and how the collagen fibres beneath the papillae change during the course of pressure sore development. 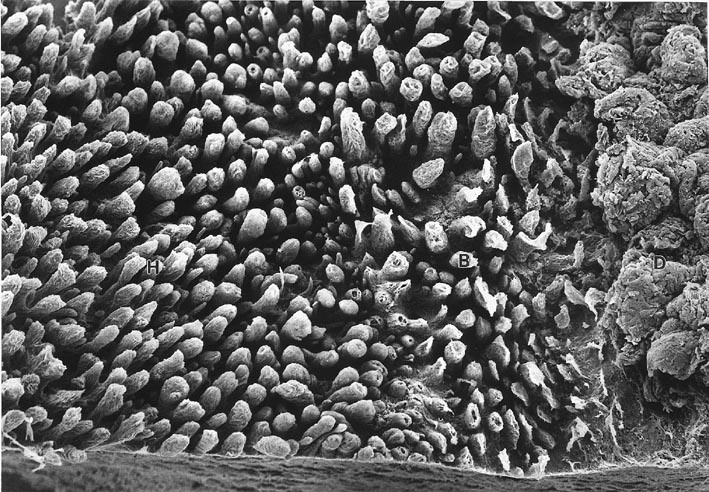 This study was undertaken to clarify the morphological characteristics of the dermal papillae in the skin associated with pressure sores using an electron microscopy. Specimens were fixed in 10% formalin and embedded in paraffin. Thick sections (5µm) were stained with a silver impregnation procedure (Bielschowsky Gömöri method) for identification of reticulin fibres and collagen fibres , . Small tissue blocks were fixed, both in 2.5% glutaraldehyde and 2% paraformaldehyde in 0.1M cacodylate buffer, pH 7.4 (Karnovsky's fixative) and in cacodylate buffered 2% osmium tetroxide 0.5% potassium ferrocyanide (pH 7.4). They were dehydrated in a graded series of ethanol and embedded in epoxy resin. Thin sections stained with uranyl acetate and lead citrate were viewed using a transmission electron microscope (JEOL 100CX, JAPAN). Karnovsky fixed tissue blocks were immersed in 2N NaOH solution for 5 days at room temperature and rinsed 4 times in physiological saline. NaOH maceration resulted in removal of all cellular elements, but fibrous elements such as collagen and reticulin fibres were left intact. The tissues were then postfixed with cacodylate buffered 1% osmium tetroxide (pH 7.4) for two hours, dehydrated in a graded series of ethanol, and dried by the t-butylalcohol freeze drying method. The specimens were coated with gold, and viewed using a scanning electron microscope (HITACHI S800, JAPAN). Light micrographs of skin containing healthy, boundary and damaged areas stained with silver are represented in figure 1. 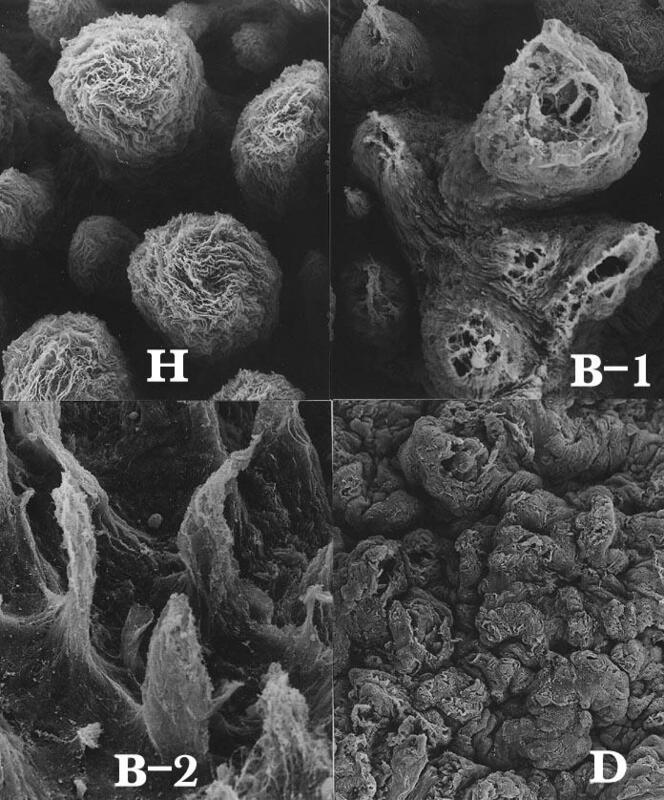 Figure 1: Light micrographs of silver-impregnated sections from human skin. In healthy tissue, the papillary layer of the dermis in contact with the epidermis consisted of relatively loose connective tissue in which collagen fibres were scarce. In addition, it was noted that the most superficial surface of this layer was bordered by a continuous thin sheet of reticulin fibres (reticulin fibre sheet). In contrast, the reticular layer of the dermis was composed of dense connective tissue containing collagen fibres showing a feltwork appearance. The boundary between the healthy and damaged areas was characterized by the presence of irregularly shaped dermal papillae and a relatively dense network of collagen fibres in the papillary layer. In the area damaged by a pressure sore, no epidermis and dermal papillae were observed and the fibrous elements of the dermis was exposed to the surface. 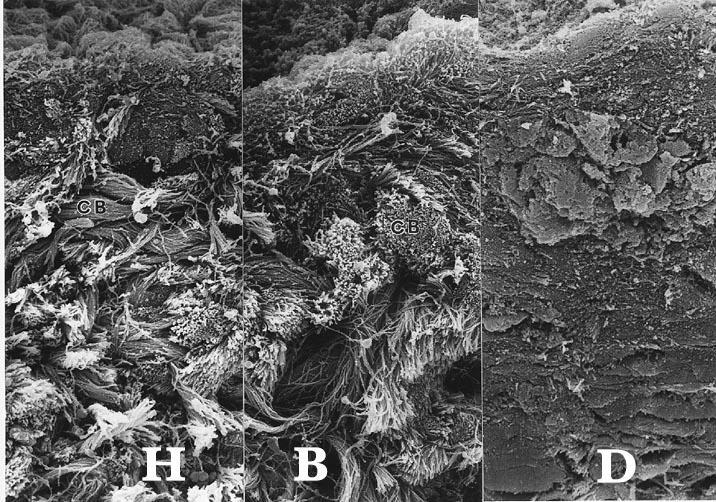 In combined SEM examinations with NaOH maceration, the epidermis and epithelial basement membrane were effectively removed and numerous dermal papillae were visualized three-dimensionally (figure 2). Figure 2: SEM image of the outer surface of the dermis treated with NaOH. The epidermis is effectively removed and numerous dermal papillae with a finger-like profile are visible in the healthy (H) and boundary (B) area. No papillae are seen in the damaged (D) area. The papillae in the healthy region showed a finger-like configuration and were compactly arranged (figure 3H). 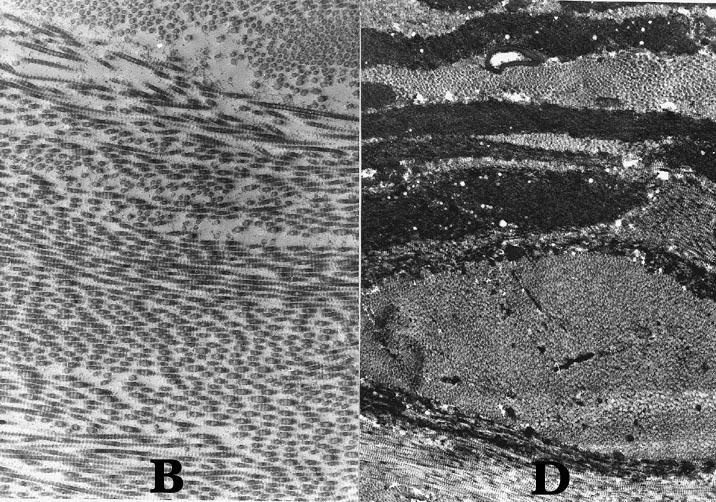 Figure 3: Dermal papillae observed in the healthy (H), boundary (B) and damaged area (D). The papillae in the healthy area show a finger-like profile and are regularly arranged. In some papillae of the boundary area, the top is broken (B-1) and the others show atrophic changes (B-2 ). In contrast, those in the boundary became atrophic and were often broken having foraminae (figure 3B). No papillae existed in the damaged area (figure 3D). Higher magnification in SEM and TEM observations identified reticulin fibres and collagen fibres. In the healthy area, the reticulin fibres consisted of a delicate network of reticulin fibrils, 40-50 nm in diameter which were distributed on the most superficial surface of the papillary layer (figure 4). 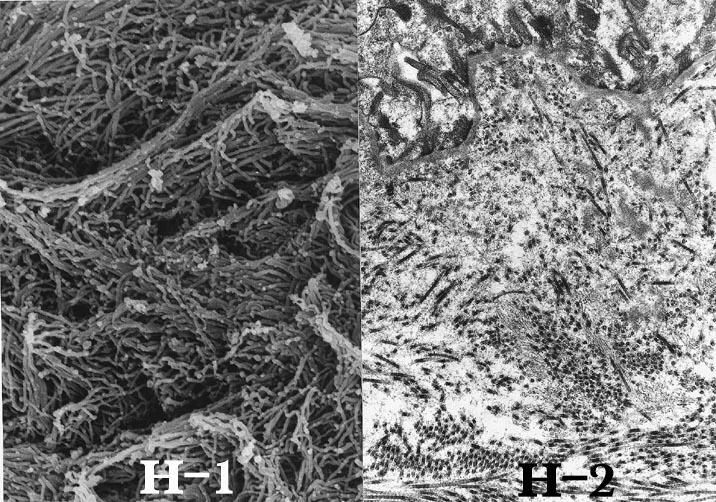 Figure 4: High-power SEM (H-1) and TEM (H-2) images of the dermal papillae in the healthy area. The reticulin fibrils were interwoven in slightly loose networks with 30-60 nm sized spaces and formed a continuous sheet (figure 4). The collagen fibres consisted of bundles of collagen fibrils, 80-120 nm in diameter, which appeared to interlace in the papillary layer of the dermis (figure 5H). Figure 5: Cut surface of the papillary layer. Bundles of the collagen fibrils (CB) are larger in size in the boundary (B) than in the healthy (H) area. The collagen bundles in the papillary layer of the healthy area were relatively loosely packed and were small in size, approximately 0.6 to 1.8µm in diameter (figure 5H). The reticulin fibre sheet in the boundary was partially broken, having foraminae sized from 6µm to 20µm in diameter (figure 3B). The collagen bundles distributed beneath the reticulin fibre sheet became large in diameter and relatively dense in the boundary when compared with the healthy (figure 5B). In the damaged area, the reticulin fibre sheet disappeared entirely and the collagen bundles appeared to be largest and most densely packed among three areas (figure 5D). In addition, most of the collagen fibrils in the damaged area were destroyed and cross-striated bands which are normally seen in intact collagen fibrils were not observed (figure 6. Figure 6: TEM images of collagen fibres in the papillary layer. (B: x 9,300, D: x 8,400). The present microscopic examinations clearly demonstrated the morphological features of the papillary layer in the healthy, boundary and ulcerated skin associated with the course of development of pressure sores although this study was based on only one case. In the healthy area, a finger-like configuration, high density and regular arrangement of the dermal papillae were characteristic. Beneath the squamous epithelium there was a dense network of reticulin fibres with small diameter (type III collagen), maintaining spaces in between that allowed transport of nutritional and tissue fluid. This space plays an important role in maintaining viability of the tissue by exchanging metabolites. However, at the boundary area, atrophy, an irregular shape and an arrangement of the papillae containing foraminae were observed when compared with the healthy area. Since the blood vessels, nerve fibres and immunocompetent cells are situated beneath the reticulin fibre sheet forming dermal papillae, it is assumed that these functions are also affected. One of the roles of reticulin fibres is to fasten the basal membrane of epidermis to the underlying dermis forming "rete pegs". At this interface, vital oxygen and nutrients diffuse into the basal layers of the epidermis. Therefore, the rupture of this layer from whatever cause, will have a serious effect on tissue viability resulting in epidermal necrosis. If tissue fluid flows into the interface through discontinuities in the reticulin fibre sheet, nourishment for the epidermis is inadequate, may be impaired, and the tissue fluid existing in the area may contribute to the formation of a blister and subsequently a break in the skin through which microorganisms can migrate. In addition, reticulin fibres distributed in the papillary layer, became fewer with increasing numbers of collagen fibres at the boundary. Stover et al reported that type III collagen is less prevalent in the upper dermis while type I collagen is more so in the reticular dermis in the denervated skin of spinal cord injured patients who are known to be at risk to pressure sore development. This finding is supported by a report in which a decrease in type III collagen in the damaged upper dermis associated with pressure sores was demonstrated using immuno-histochemical analysis. The atrophy and broken reticulin fibre sheet observed in the boundary of this study may relate to the decrease in type III collagen in the papillary layer. However it is not known how these changes in collagen characteristics in the papillary layer of the dermis will affect the biomechanics of the tissues and their viability during prolonged loading. In the damaged area, there were no papillae and collagen fibrils were destroyed. This indicates that in the damaged area, blood supply and nourishment to maintain cell viability no longer function. The morphological features of a pressure sore observed in this study, in particular in the boundary area, correspond with the diagrammatic representation of Barnett. Further study is needed to confirm these results with a number of subjects since the appearances of other ulcers might be different. Furthermore, in order to establish an in-depth understanding of the aetiology of pressure sore development, whether there is a correlation between physiological changes measured at the skin surface and morphological changes observed in the upper dermis of the skin, should be determined. It was found that the atrophic, irregular shape and alignment and presence of foraminae of the dermal papillae were characteristic of the boundary area between healthy and ulcerated areas. These results suggest that the morphological changes of the papillae and the papillary layer observed in the boundary area may relate to impairment of tissue viability in the development of pressure sores. We are most grateful to H Kitamura and H Kawasato for their technical supports in preparation of skin tissues and Profs Barbenel and Ferguson-Pell, Bioengineering Unit, University of Strathclyde and University College London, respectively, for their help in the preparation of this paper. Kosiak M. Etiology and pathology of ischemic ulcers. Archives of Physical Medicine and Rehabilitation 1959; 40: 62-68. Willms-Kretschmer K, Majno G. Ischemia of the skin. American Journal of Pathology 1969; 54: 327-343. Daniel RK, Priest LD, Wheatley DC. Etiologic factors in pressure sores: an experimental model. Archives of Physical Medicine and Rehabilitation 1981; 62: 492-498. Hagisawa S, Barbenel JC, Kenedi RM. Influence of age on postischemic reactive hyperemia. Clinical Physics and Physiological Measure 1991; 123: 227-237. Schubert V, Fagrell B. Evaluation of the dynamic cutaneous postischemic hyperemia and thermal response in elderly subjects and in an area at risk for pressure sores. Clinical Physiology 1991; 11: 169-182. Witkowski JA, Parish LC. Histopathology of the decubitus ulcer. Journal of the American Academy of Dermatology 1982; 6: 1014-1021. Barnett SE. Histology of the human pressure sore. CARE Science and Practice 1987; 5: 13-18. National Pressure Ulcer Advisory Panel. Pressure ulcers incidence, economics and risk assessment. CARE Science and Practice 1989; 7(4): 96-99. Gömöri G. Der mikrotechnische Nachweis unlöslicher Kalksalze in den Geweben. Virchows Archives 1934; 286: 682-689. Montes GS, Krisztan RM, Shigihara KM, Tokoro R, Mourao PAS, Junqueira LCU. Histochemical and morphological characterization of reticular fibers. Histochemistry 1980; 65: 131-141. Ohtani O. Three dimensional organization of the connective tissue fibers of the human pancreas: a scanning electron microscopic study of NaOH treated tissues. Archivum Histologicum Japonicum 1987; 50: 557-566. Fleischemajer R, Gay S, Meigel WN, Perlish JS. 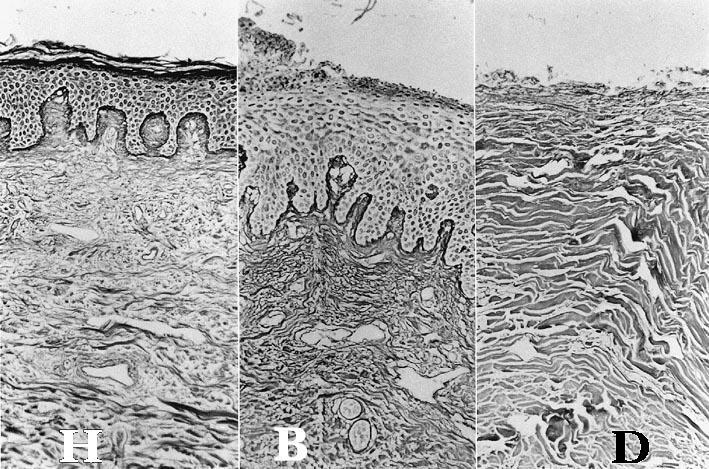 Collagen in cellular and fibrotic stages of scleroderma. Arthritis and Rheumatism 1978; 21: 418-428. Stover SL, Gay RE, Koopman W, Sahgal V, Gale LL. Dermal fibrosis in spinal cord injury patients. Arthritis and Rheumatism 1980; 23: 1312-1317. Yano H. A study of mechanism of development of pressure sores and preventive tools II. Annual Report of Science and Technology Promotion Bureau, 1987 (Japanese). This article was originally published in the Journal of Tissue Viability 1998, Vol 8, No 3, pages 17-23. The copyright of this article remains with the Tissue Viability Society.